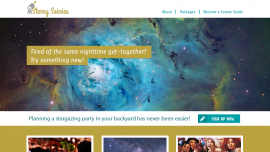 I kind of ran with the party idea and created a fictious service called Starry Soireés. Basically the concept is that you can call to have a trained, knowledgeable amateur astronomer come host a star gazing party at your house. I wanted to pick a striking yet familiar color scheme that is still condusive to the whole "night sky" kind of situation the service is based on. I'd love some feedback on those choices. I want to keep it fun and playful to really play up this party kind of concept. The photos are more of placeholders just to kind of get the feel of the placement. This is what I have so far and I appreciate any feedback! I changed the colors up a bit after looking at it from a different monitor -- much too bright! I also added the bottom half of the site and switched up a few elements. I made what the service does more prominent and changed up the bottom testimonial section a bit.